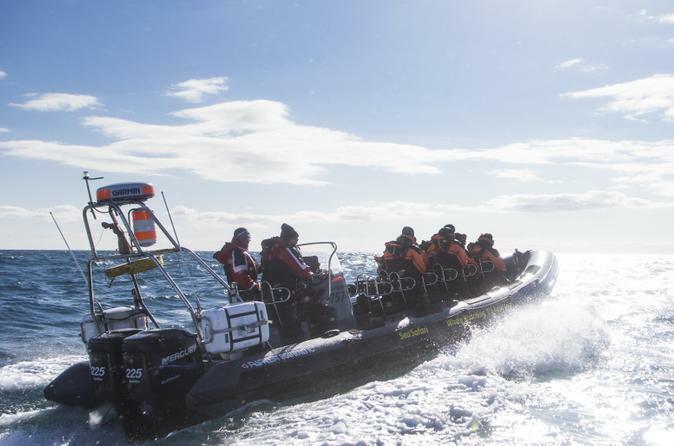 Board a rigid inflatable boat (RIB) for a 1-hour evening cruise from Reykjavik, explore Iceland’s rugged shoreline and see the capital at night from Faxaflói Bay. Cast off from the Old Harbor and spot the city’s gleaming landmarks — Harpa Concert Hall and Sun Voyager are a dramatic contrast to the stark landscape — then explore the wilderness that’s just beyond the city limits. Slip into a fjord to take in the alpine skyline, and navigate alongside swooping seabirds as you visit the site of a seasonal puffin colony.